In his second visit to China in 10 months, Apple Chief Executive Tim Cook met with the country's head of industry and information technology to discuss the tech industry. Cook's visit with Miao Wei of the Chinese government was revealed by the Ministry of Industry and Information Technology, according to Bloomberg. The two reportedly discussed Apple's business in China and the global communications market. 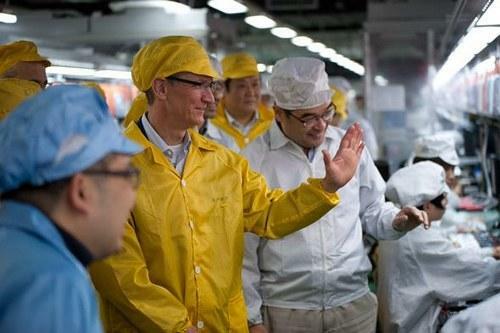 Cook was previously in China last March, when he visited a Foxconn factory that assembles iPhones. On that trip, he also met with Chinese Vice Premier Li Keqiang to discuss intellectual property issues, as well as potential cooperation with the Chinese government. Last year, Cook's visit to China came as Apple was under fire for working conditions in its suppliers' factories. Critics contended that companies like Foxconn had employees work long overtime hours for inadequate pay. In the last 10 months since Cook's previous visit to China, the conversation has changed considerably. Apple now offers monthly updates from audits of its suppliers, the company has pledged $100 million to produce an entire line of Macs in the U.S., and there has even been speculation that Apple has subsidized wage increases for workers at Foxconn. Foxconn has faced criticism for years, as some have referred to the electronics maker as a "sweatshop" where employees work long hours for little pay. The company has worked to improve its image, and Apple has encouraged those changes with a series of audits, including new independent reviews from the Fair Labor Association. Since then, new stores have opened in five more locations, including Chengdu and Hong Kong's Hysan Place and Festival Bay. There are now 11 Apple Stores in Greater China.